Every one who have a blog, and he was monetize it with Google AdSense Ads or any other third party ads, they always want to show these ads more and more to their readers and making more and more money. Floating AdSense ads is an effective and profitable ways to increase your earning with advertisements, because when people scrolling down, these ads automatically float with scrolling down. So your visitors always see these ads , many times they clicking on your ads and you can make more money from Google AdSense . It is not compulsory to use Google AdSense only, you can also use alternatives to google adsense or any other third party ads network and monetize your blogs or website. In this article, I’m show you how to add floating ads into your blog sidebar. But before the proceeding, always try to read the terms and conditions of any ads network or any affiliate networks , for using their ads on your blog. I’m always recommended you to use well sized and good placement ads. The most recommended ads size is 300px X 250px or 160px X 600px, these both are very popular and google also recommended you to use these size ads banner and make more money from your site using Google AdSense. Now in this post, I’m show you how to add floating ads into your blog sidebar in blogger blogs or WordPress blogs , but you can use this on any other CMS system. Step 1 – First of all go to your blogger dashboard . Step 2 – Select your blog and go to your “Layout” link. Step 5 – Click on “Save” button and Save Arrangements and view your blog. First of all replace the “Ad Code Here” with your Google AdSense ad code or any other third party ad code and click on save button. Now change the 160px width with your requirement and increase or decrease according to the ads size which you can use here. If you want to show this ads into your blog right sidebar or left sidebar then change the “Right” , because this will show ads on right sidebar but you can easily change. 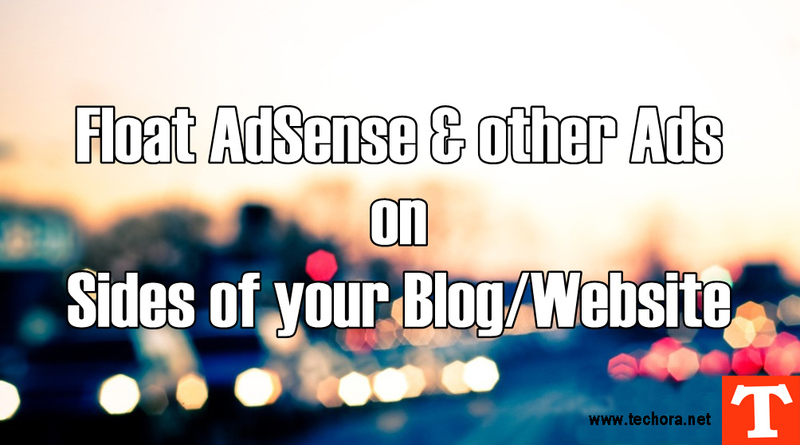 So in this way you can add the floating AdSense ads into your blog sidebar and increasing your revenues. Because with this technique, your impressions / pageviews and clicks automatically increase , so as a result your AdSense revenue increase.